We may not think of our lives as being particularly stressful but, when you break it down, day by day we can actually come under a lot of strain. We can come under emotional strain in our relationships and managing our emotional responses to the world around us. We can come under mental strain as we deal with work or study related stresses. And we can also experience physical strain through our daily activities or exercise routines. And it’s ok. Recognising these strains doesn’t mean we need to feel overwhelmed, but it can help us realise why we need to support things into our lives that help take the strain. For instance, we can take the strain off mentally with hobbies that help us de-stress, we can offload emotional stress with supportive friends around us and, last but not least, we can help take the physical strain of the day away with a supportive mattress as we lay down to sleep. In fact sleep is a natural reset button for all of these types of strain (emotional, mental and physical) as sleeping well better equips us to manage. So how supportive is your mattress? 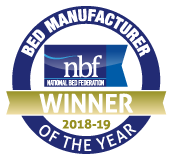 At Millbrook Beds, our luxury mattresses are handmade using thousands of pocket springs that are individually nested to provide superior and unique support to your neck and spine. How? A cheaper open coil mattress uses spring units where the springs are linked, so if you apply weight to one area of the mattress it will cause the surrounding springs to move. However, in a quality pocket sprung mattress such as those made by Millbrook Beds, each spring is individually nested. This is crucial to providing enhanced support as it enables the spring to move independently from its neighbouring springs, meaning each and every spring provides support. Support your sleep needs with luxurious pocket sprung support from Millbrook Beds.